Using AirPrint wireless technology, students can easily print documents from their classroom iPads. AirPrint prints from the iPad to AirPrint-enabled printers without the aid of extra apps, drivers, or cables. This means that printing is built right into your iPad. More good news: You can print from your iPad without the help of that expensive IT guy. AirPrint is a wireless technology that creates a connection between AirPrint-enabled applications on your iOS device and any printer that supports AirPrint technology. So, in short, you can print from your iPad . . . but only from iPad apps that include AirPrint support and only to printers that are AirPrint enabled. To check whether a printer is AirPrint enabled, go to the Apple support website, where a list is constantly being updated. Tap the curved-arrow action icon. Your printer isn’t turned on, has an error such as an empty paper tray, or needs a firmware update. Your printer isn’t connected to the same Wi-Fi network as your iPad. AirPrint works only if the two are on the same Wi-Fi network. Your printer doesn’t support AirPrint printing. 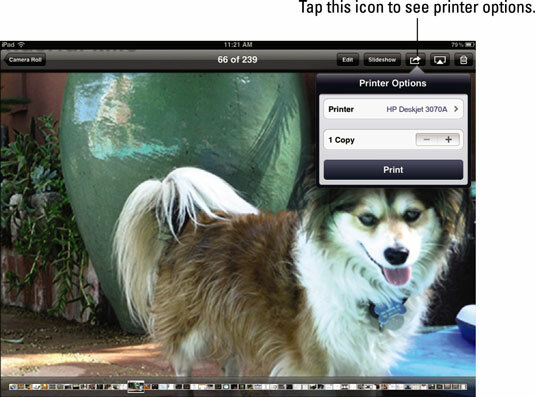 If your printer is listed, configure the printer options and tap Print. At this point, you’re either elated to see your print job coming out of the printer or cursing and wondering how you’re going to print. Relax there are options for those with and without AirPrint-enabled printers.